There is no evidence that the Latin rock legend has covered the venerable [mostly] instrumental classic. (The original version by The Champs features a tasty rhythm guitar track.) 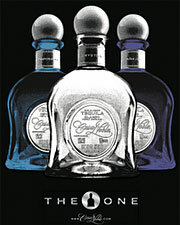 However, Santana has added a high-quality tequila to his growing line of Santana-branded products. 200-year-old Casa Noble, now co-owned by Carlos Santana, produces premium Tequila. Santana's suite of products currently includes a women's shoe line (Carlos by Carlos), cologne and perfume (Santana for Men, and Santana for Women, respectively), a culinary chain (Maria Maria restaurants) serving a variety of creative Mexican food, a new line of Women's handbags (purses, currently also under the Carlos by Carlos label), and a selection of hats and berets (Corazon Espinado). Of course, one of the most requested products is no longer available: Santana DVX, a brand of sparking wine (sometimes incorrectly called champagne) made notorious by the satirical song of the same name released years ago by a comedy/rap group The Lonely Island. Unfortunately, though apparently still in high demand, this brand has not been around for nearly 10 years. And, it goes without saying that the Santana family of products also includes guitars (PRS Santana Siganture models, and Yamaha SG guitars), strings (GHS "Big Core" strings), and the reputation for providing the name and inspiration for the development of the modern amplifier distortion sound (Mesa Boogie amps). Though it's not clear what first connected Santana with the Casa Noble company (maker's of Santana's tequila brand), rumor has it that is was love at first taste. Casa Noble does have a reputation for producing very highly-ranked spirits, and they've been around since the late 1800s. It may have helped that both Carlos Santana and the Hermosillo family trace their roots back to Jalisco, Mexico. In addition, the distillery goes the extra mile in producing their liquor: their organic, handrafted tequilas are thrice-distilled (as opposed to the more common twice-dstilled process). The Hermosillo's dedication to the quality of their spirits should make for a good relationship with Carlos. In fact, Santana states: "I like people who have passion for excellence, passion for not doing shortcuts, for not skimping, for not making excuses." Considering how much interest the long-gone Santana DVX Sparkling Wine still generates (thousands of people search every month for where they can buy it), Casa Noble and Carlos Santana could have a real winner on their hands.